Manufacturer: Outside Inside by GSI Outdoor, Inc. 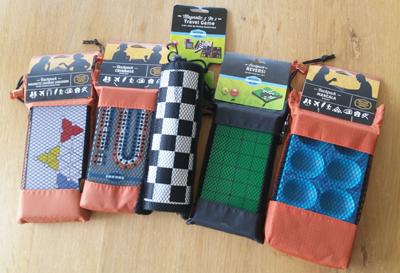 The 5-in-1 Backpack Game Kit is stored in a mesh carrying case with an attached carabiner and includes five games; chess, checkers, ludo, backgammon and Snakes and Ladders. The game boards are rolled to fit into the carrying case. All five games can be played by two players. Reversi is a two-player strategy game for ages seven and up. 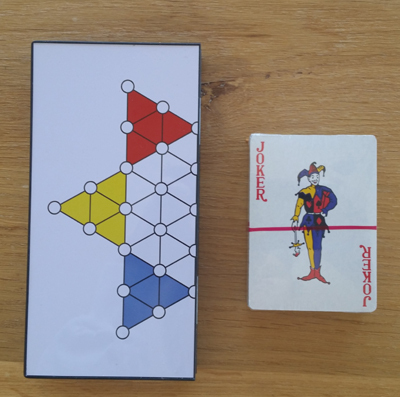 It has magnetic game pieces, a fold-up game board and comes in a mesh and vinyl pouch that cinches closed with a cord and barrel lock system. It also has an attached carabiner. 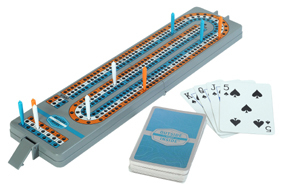 The full-size three-track folding Cribbage board is constructed of ABS plastic and includes playing cards and pegs all in a mesh and vinyl pouch with a barrel lock/cord drawstring closure. Cribbage can be played by two players. The foldable Chinese Checkers uses magnetic game pieces and can be played by two to four players. It comes in a mesh and vinyl pouch that cinches closed with a cord and barrel lock system. The Mancala game board is made of plastic and is foldable with a security clip closure. It comes with 48 beads and a mesh and vinyl pouch that cinches closed with a cord and barrel lock system. Initially, I'm SO impressed with these games from Outside Inside by GSI Outdoors, Inc.! Since these are advertised as backpacking games and weight is always an issue with backpacking articles, I was sort of expecting flimsy little game boards and cheaply made little game pieces. And while the games and playing pieces are small-sized - perfect for packing up - "flimsy" and "cheap", they are not! The materials used in the game board surfaces appear to be sturdy and of good quality. The edges of the plastic surfaces are smooth and without sharp bits. The magnetized surfaces have sufficient "holding" power to keep the game pieces in place but still easily moveable. Easy to use latches keep the games in the folded position. I really like the individual game pouches! They appear to be very ruggedly made and fit the games perfectly - easy enough to get the games in and out but no excess materials to take up extra pack space. The cinch closures close tightly with corded barrel locks to keep everything nice and tidy. Since pack space is always a consideration for me when backpacking, I am pleased to see that the games really don't take up much more space than a deck - OK, two decks - of cards. My only concern right now is whether or not I will lose any of the game playing pieces on the trail. They are small! If that happens, I hope I can easily buy replacement pieces. I am rather klutzy! 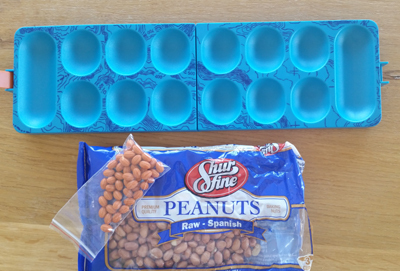 Spanish Peanuts for Mancala Games Pieces? Overall, I am very pleased with the games and can't wait to try them out! Each of the games comes with a complete set of instructions. I certainly can't read some of them - like Reversi, Chinese Checkers and the 5-in-1 set, but then again, I have horrid eyesight anyway! Others, like the Mancala and Cribbage are fine. Fortunately, on the website, there is a link under the details for each game which pulls up a nice, easily readable and clearly understandable, set of instructions. I've already printed them out in a font that I can actually read. While my-sized font adds a bit more paper and a miniscule amount of weight, at least I won't have to trust my trail-mate(s)' interpretation of the rules! Besides, I'm hoping that, for the games I don't already know how to play, after a few rounds, I won't need instructions anyway. I'm so excited to be participating in this field evaluation of the Outside Inside games by GSI Outdoors, Inc.! My whole family (and trail-mates) loves to play games and most nights when we are together, we do play games at home. Up until now, when we are backpacking our only night-time entertainment as far as games go has be various card games. We have even been known to make up a card game when we were stuck inside a rain-lashed tent for hours! Over the last couple of months, I didn't get to go to any exotic backpacking locations - heck, with the Thanksgiving, Christmas and New Year's holidays, I'm lucky I got in a couple of overnights at all! Love the season, but it sure puts a dent in my outside treks! I did wiggle in some time in the backcountry of Fremont County on the unmarked trails and primitive camping of the Bureau of Land Management (BLM) acreage adjacent to my home and in southern Canon City territory. This means lots of dirt, rocks, scrubby pines and juniper and not much else. It means not-so-flat campsites and absolutely no shelter from trees due to their rather stunted height. It's been warmer than usual with daytime temperatures averaging in the low 60s F (16 C) during the daytime and just about freezing at night. Though we probably have had more snow this winter so far than the last couple of (complete) winters, I did not encounter snow on any of my overnights. However, thanks to early sunsets, I spent relatively more time in the tent than on summer outings. I also had to endure four domestic flights with their attendant gate waits, the last couple of months as well. And while it is the farthest possible environment - IMHO - from the great outdoors, for this field report evaluation, those occasions were relevant. 1.) They are fun! Each of the individual games is easy to learn and actually fun to play for all ages (I've played with 9 year olds up to 69 year olds). And while each of us has our favorite, my grandkids, kids (who are my most constant trail-mates) and real-life mate all agree with my "easy/fun" assessment. My favorite is Chinbese Checkers, probably because I can actually win it sometimes! 2.) They are convenient! The rolled-up games are compact and tucking them into a backpack takes up no more room that some extra socks. The included carrying sack keeps everything together in one place, so I've yet to lose any pieces (knocking on wood!). 3.) The magnetized surfaces work flawlessly in keeping the playing pieces on the boards in the places we put them. No worries about a slight jarring of the board sending the small pieces into the brush or into a sleeping bag where I would be sure to encounter them embedded in my body later while sleeping! 5.) Did I mention the games are fun to play? Oh, yeah, #1! But it bears repeating because we did have a blast playing the games and plan on continuing to have fun with them whenever we can. As someone who has spent hours in a confined space - whether an airplane or a tent - I fully appreciated the value of entertainment that makes those hours less tedious. And when that entertainment is conveniently-sized, easy to pack, easy to use and requires no special care...well; now...that's my kind of entertainment! The Outside Inside Backpack Games are all that, but their biggest attraction is, they are fun! They are fun for whiling away tent-time during a storm. They are fun for trail-side picnics in the sun. And they are fun in monotonous airports and airplanes. I plan to always pack one or two of the games every time I head out for a long stretch in the hills (or valleys and plains) and definitely, as well, for air travel. I never know when I will have downtime. Thank you to and GSI Outdoors, Inc. for the opportunity to have even MORE fun on the trails and in camp. Chinese Checkers, anyone?